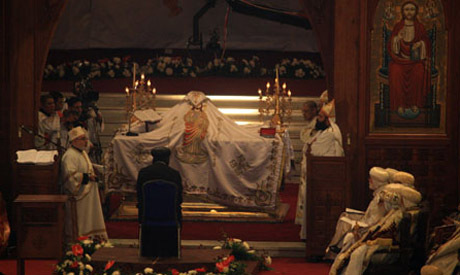 The new pope of Egypt’s Orthodox Coptic church has been enthroned. Pope Tawadros II, 60, was elected earlier this month, but the televised official enthronement ceremony was held Sunday at the Coptic cathedral in Cairo. He replaced Shenouda III, who died in March after leading the ancient church for 40 years. Egypt’s Christians make up about 10 percent of the nation’s estimated 83 million people, making them the largest single Christian community in the Middle East. Christians have long complained of discrimination, particularly in the last four decades as the country’s Muslim majority moved toward religious conservatism. The rise to power of Islamists after the ouster nearly two years ago of authoritarian leader Hosni Mubarak has deepened their concerns amid increasing attacks targeting their churches and businesses. Amid increased fears about the community’s future after the overthrow of Mubarak, Tawadros will be its main contact with Islamist President Mohammed Mursi. Tawadros told Al Arabiya earlier this month that the security situation, not the dominance of Islamists, is what prompts Egyptians – Christians and Muslims alike – to leave the country, new. Tawadros said since country’s 2011 revolution, the security situation compelled Egyptians to emigrate, rebuffing claims that Coptic Egyptians are leaving the country more than Muslims. While Shariah (Islamic law) is not applicable to Christians in Egypt, Tawadros rejected article 2 in the constitution , which states that the “principles” of Islamic Sharia law are the main source of legislation. He said article 2 will not grant Christians in Egypt their rights. The marginalization of Christians is what has compelled his predecessor, Pope Shenouda III, to take more of a political role. But he is uninvolved in politics, he said, adding that the Church as an institution is spiritual and not political. He also made comments regarding Egypt’s relations with Israel. He said there are no planned trips to Jerusalem and if there are, Egyptian Christians and Muslims will go together.